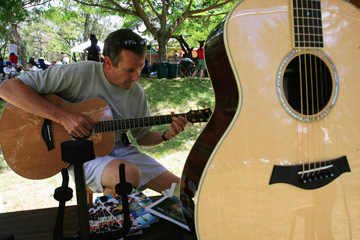 Dave Cureton of Pleasanton, Calif., tried out a Taylor acoustic at the Island Guitars tent yesterday afternoon during the 24th Annual Hawaiian Slack Key Guitar Festival at Kapiolani Bandstand. This year's theme was "Oahu Style" and featured ki hoalu artists young and old. 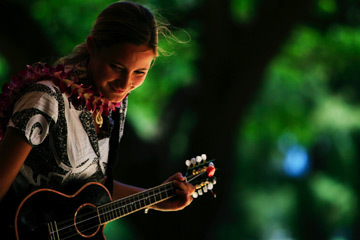 Seventeen-year-old ukulele phenom Taimane Gardner flashed a smile while bowing after her performance. 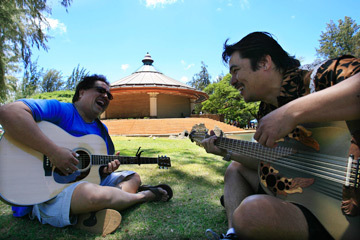 Ho'okena's Glen Smith, left, and Horace Dudoit shared a laugh while warming up with a tune called "Keawaiki" before their set.